In a recent post, I mentioned that October 9 is National Chess Day in the U.S. Alas, in my never-ending quest to provide you accurate and timely information in this blog, I now have to correct myself. 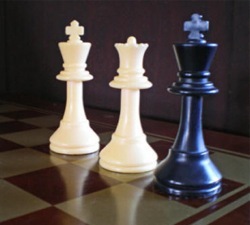 According to the Wall Street Journal, the U.S. Senate voted yesterday to make October 8 National Chess Day this year. I don’t know the reason for the change. Presumably someone thought the holiday would be more widely observed if it fell on a Saturday rather than a Sunday. If any of you were making plans for October 9 and now have to change them to October 8, I apologize for the inconvenience. Oh well, so much for political chess humor. It’s not so easy to combine the two, you know. Actually, I’m not sure there is anything humorous about politics any more. I am curious to find out what blog system you are using? I’m experiencing some minor security problems with my latest site and I’d like to find something more risk-free. Do you have any suggestions? Next post: Stop Presses II … Elizabeth Vicary Gets Hitched!